Sept 2: I took advantage of my new low-mileage schedule to sleep in until 8:30, and when I finally got, my tarp was wetter than ever. The irony being, of course, that I set it up hoping to dry overnight. Ha! It didn't rain overnight, but the condensation was absolutely awful, and while my tarp wasn't any drier, I was still felt fortunate that I set it up. Had I not, *I* would have been soaked. Hui caught me as I was breaking down camp. He was one of those hikers who looked vaguely familiar, but I couldn't quite figure out from where. Apparently I was more memorable, however, because he certainly remembered me, asking whatever happened to that dog Charmin and I had found on the side of the road. He was hiking with Shang-hi at the time, and that was the one and only time we had ever crossed paths.... until now! And if you guys still want to know what happened to that dog, I don't really know for certain what happened after it arrived at the animal shelter, but I'm optimistic that it's owner found him since the animal shelter doesn't seem to have any record of the dog anymore, and Dezert Ratty told me they think they might have found the owner. =) But details are sketchy, and I'll likely never have full closure to that particular story. Hui and I hiked on and off together throughout the day, stopping for a break at Jizo, the patron saint of travelers. 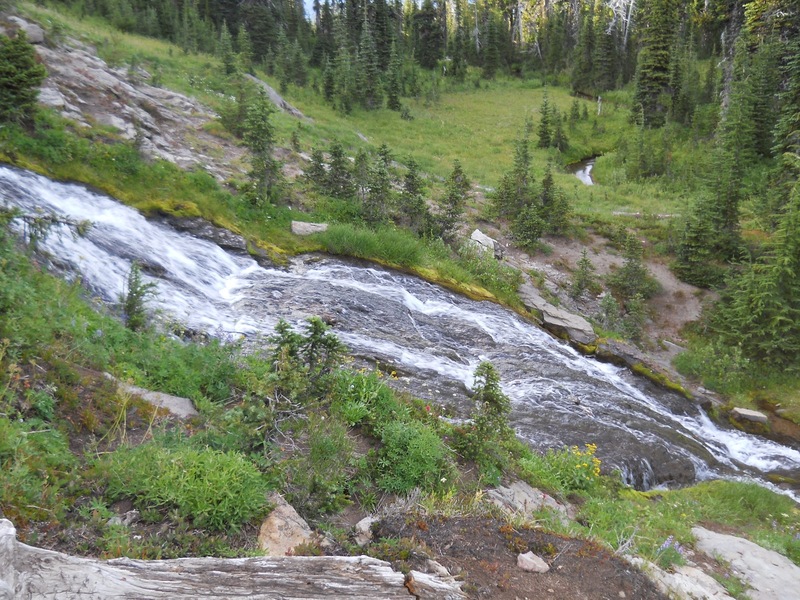 It was along Road 23 where many hikers often hitch a ride down into Trout Lake. 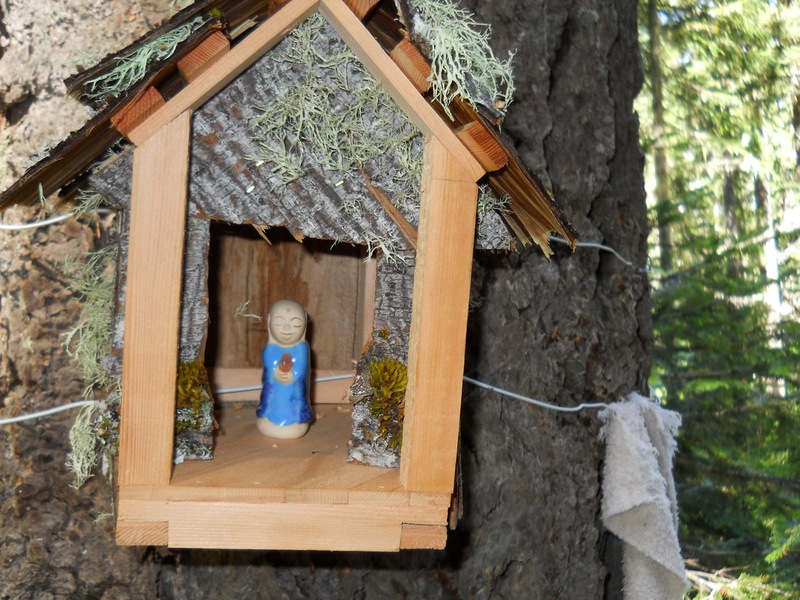 We didn't do that, but a local monastery left a large trash can filled with trail magic. 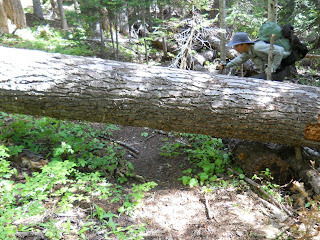 Hui and I stopped to enjoy the trail magic, and throw out our tarps and tents in the sun to dry out. Hui bushwacks around this treefall. 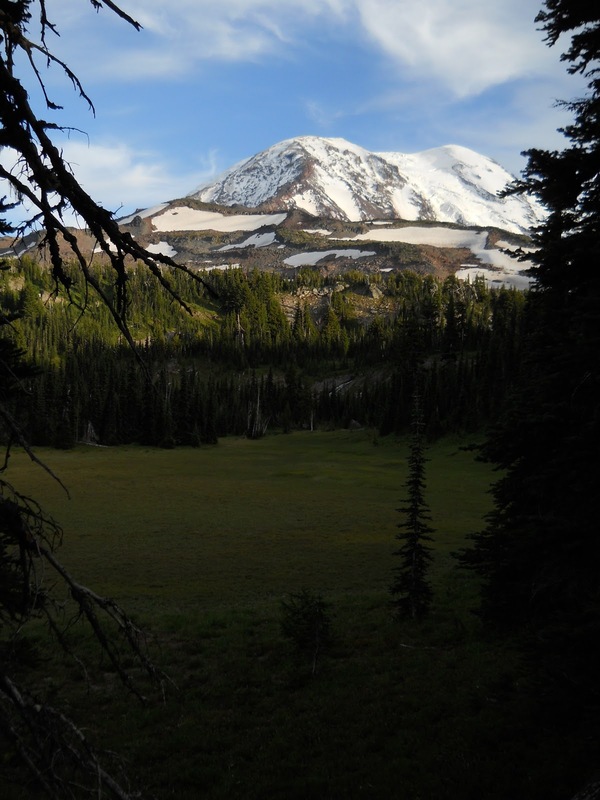 The trail headed higher up Mount Adams, skirting around its flanks near the tree line. Views were absolutely spectacular. 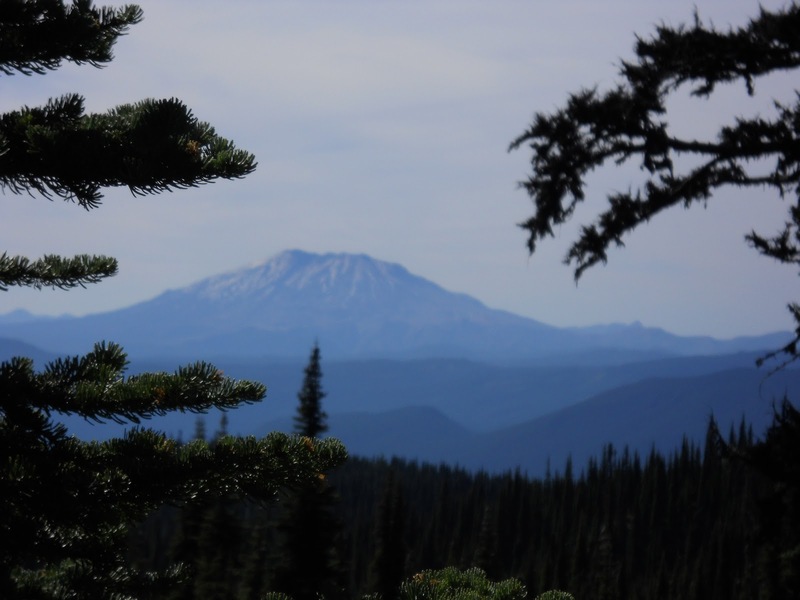 Mount Rainier dominated in the north, and Mount St. Helens rose in the west. The trail wouldn't go by Mount St. Helens, but I pointed to Mount Rainier. "I'm coming for you," I told the mountain. "You're next." And of course, I was on Mount Adams, close enough to see the giant cracks in the glaciers and the dusting of new snow at the top from the rainstorm I suffered through the previous couple of days. It was one of those jaw-dropping views that photographs can never properly capture. I was in a pretty good mood. =) I pitied the poor hikers ahead of me who had to hike through this area in the rain. At least most of the time I was in the rain, I was also in trees and so I didn't miss a whole lot of views. The people hiking through here during that time.... they missed out big time. 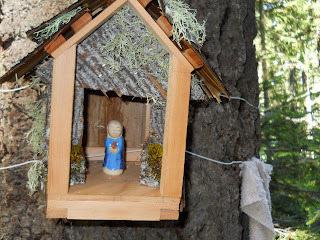 "The small shrine above the food and trash cans is Jizo. (2) anyone at a crossroads in life, and (3) children." At Adams Creek, I stopped for a snack break and admired my handiwork. I helped build this trail. The river had washed out the trail, and I went out with the WTA and spend the better part of a week rebuilding this little section of trail from scratch. It was the first time I had been back since then, and I was anxious to see if the trail was still there. It crossed a river channel, after all, and who knows if it washed out in the subsequent three years with the spring runoff? But the trail was still there, every curve and bump exactly like I remembered it. And it's funny how many details I did remember. 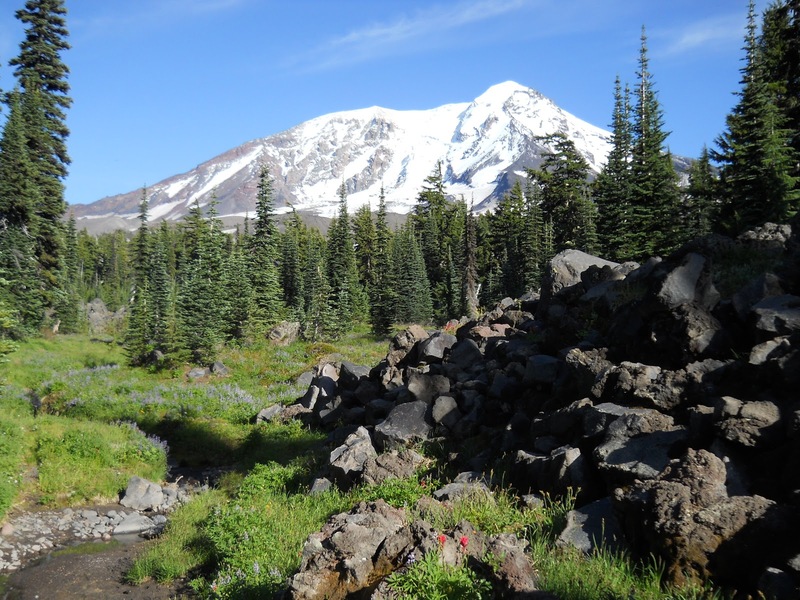 I remember one particular spot where there was a small, six-foot drop, and we talked about if it was too steep or if we should find a different route around that point for the trail, but we plowed through, and the trail still plowed through there. 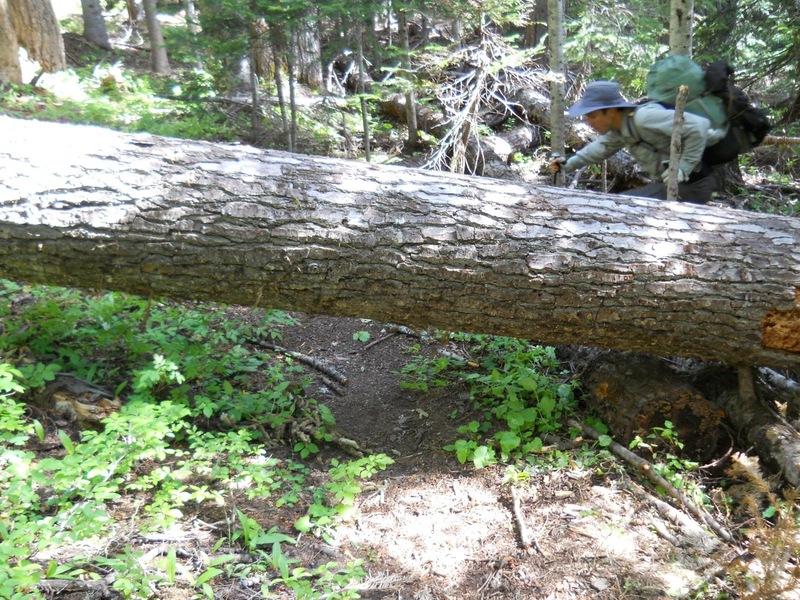 I remembered one particular tree that had fallen across where we wanted the trail to go, and it wasn't a very big tree, but it was practically buried in the sand, and we originally weren't going to do anything about it. A relatively minor issue, but I had finished up with other stuff I was working on and the others weren't done with a section next to the river, so I decided to pull it out. And it took me nearly a half hour, but I finally got that tree completely out of the way. 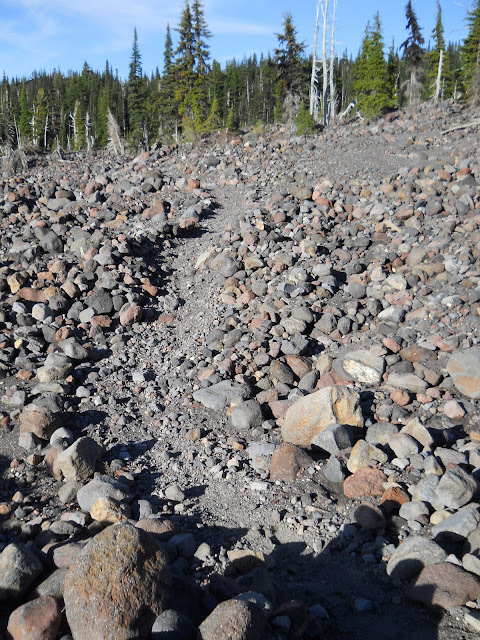 The little rocks we used to line the trail were still there. Hui closing in on Mt. Adams. 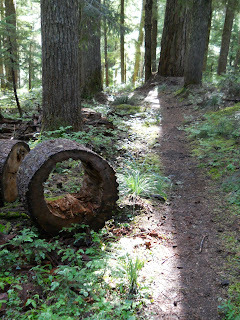 Every bump and turn in that short section of trail had a story to tell, and most people hiking by will never know it. They don't know who built the trail, when it was built, or what it looked like before it was built. 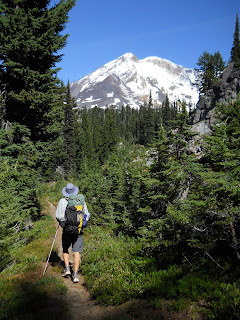 And for most of the Pacific Crest Trail, that applied to me as well. 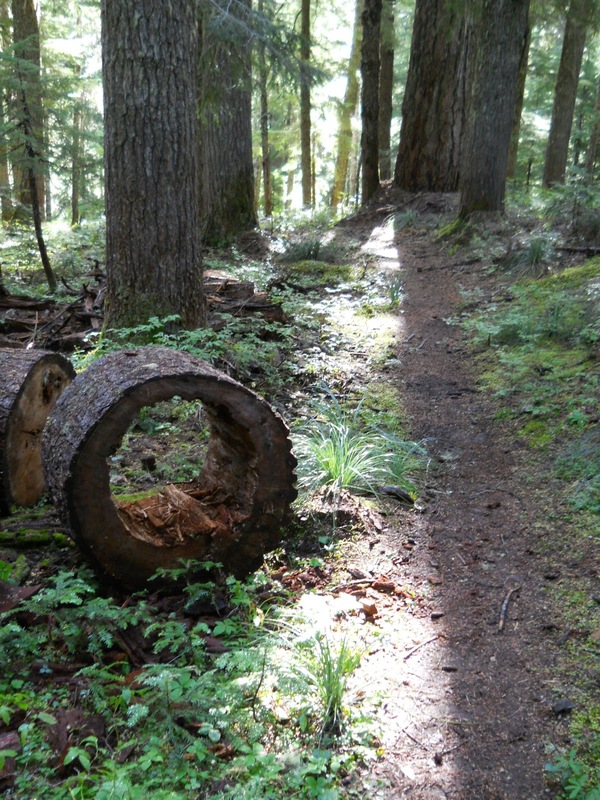 Occasionally I passed work parties and stopped to chat with them, but most of the trail, I don't know who built them, or when it was built, or which parts were particularly problematic. But every turn the trail makes was decided by someone. Every bump that was left in the trail was decided by someone. 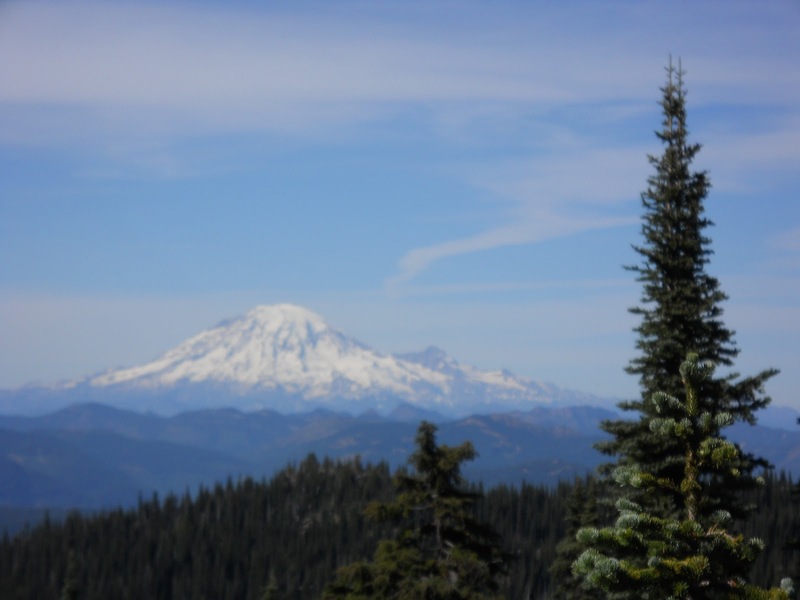 The building of the PCT probably involved trillions of little decisions. Kind of remarkable it ever got done when one ponders it, and it's amazing to think what man-kind can accomplish when we put our efforts into it. After sunset, we all went to sleep, but I suffered a serious case of insomnia, tossing and turning and not feeling at all tired enough to fall asleep. The shooting pains that went through my left foot didn't help much either, and I popped a couple of vitamin I, but it didn't seem to do any good. I don't know why, but sometimes, at the end of the day, I get these shooting pains in one or both my feet. Perhaps once every couple of weeks. During the day while hiking, no problem. At night, after I got to sleep, pain. In the morning, it's like nothing happened. And strangely, it seems like it happens most often when I hike short days. You'd think hiking a long day might cause that, but a short day? *shrug* I don't understand it, but I have had to learn to live with it. Usually a couple of ibuprofen will take care of the issue and let me get to sleep, but it didn't seem to be working tonight. I finally got out and walked into the meadow to do a little star gazing. The stars were absolutely stunning, far away from any cities, and the skies were completely clear. A few minutes later, Rising Sun came out and joined me, drawn by the red light of my headlamp. The red light threw him off--all hikers carried flashlights, but red? "Preserves my night vision," I told him. =) We talked for a couple of minutes, then he went back to his tarp. I stayed out for another half hour admiring the night sky before crawling back in under my tarp for the night. I didn't expect rain overnight, but I set up my tarp for the same reason I did the night before: Hoping it would dry out, and if the condensation was anything like it was the night before (and standing in the meadow for that short while, I could feel condensation forming on me already! ), it would keep me dry. What a fantastic day for a hike! It's hard to tell in my photos, but there's actually a light dusting of fresh snow on Mt. Adams. 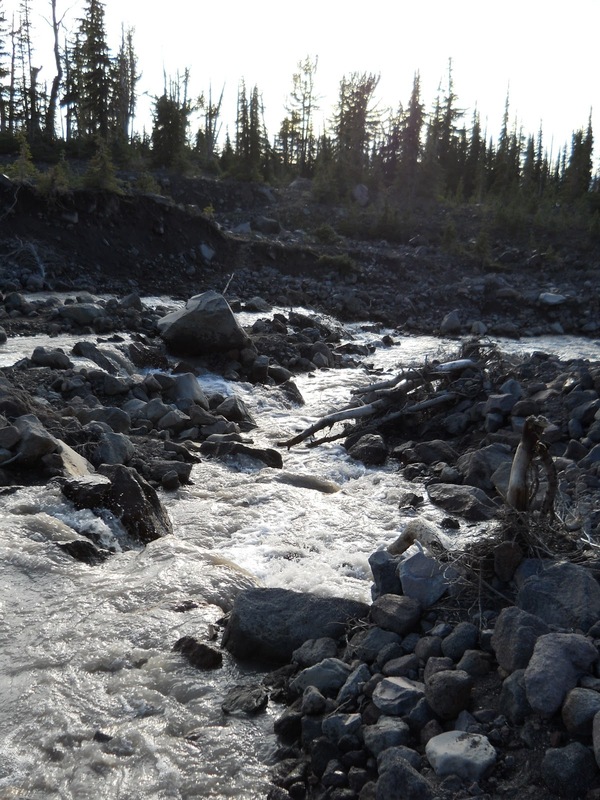 All the snow on the glaciers washes out the fresh snow in my photos, though. digging out a buried tree from the trail here. Meadow near Killin Creek with Mt. Adams in the background. I love seeing these pictures! Its so nice to see beautiful land undeveloped. Vitamin I... That's Ibuprofen, right? I've never heard it called this before... Thought for a split second that there was a vitamin that helps with pain, then thought, wait - there's no such vitamin... And THEN the light went on. Yeah, you have to get up pretty early, to succeed at confusing Hansenclan -- NOT!!! Great photos. The meadows are so pretty and lush and green. But I bet they were also mosquito magnets. bah!